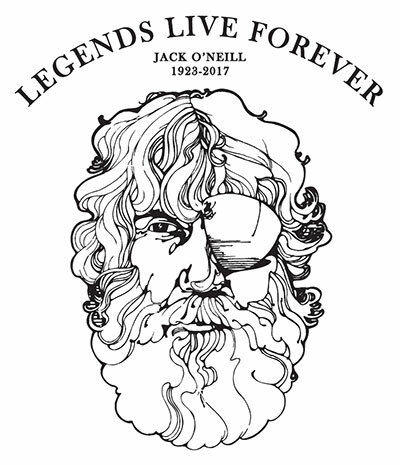 Jack O'Neill was the inventor of the wetsuit and past away last year, Jack always looked to improve the technology in every suit to enable people to stay in the water for longer without getting tired. This drive to continuely improve has made O'Neill into the biggest wetsuit brand in the world re-knowned for high quality neoprene's and performance wetsuits. The Jack O'Neill Legend Wetsuit range is a limited edition suit to commemorate Jack's life by producing a suit with all the latest warmth and flexibility features possible to bring you one of the best wetsuits O'Neill have ever produced. The suit uses the latest Technobutter 3X neoprene which is absolutely incredible in terms of touch and flex. Once on it has to be said it is one of the best wetsuits we have ever used. The air insulated neoprene in terms of warmth is second to none in terms of keeping you warm in the water. This really is the warmest and most flexible wetsuit we have had the pleasure to offer you. Only 300 have been produced for Europe so you will also own a piece of history too.